You are here: Home / Blog / pediatric occupational therapy / Would you like to write up OT evaluations in half the time? Would you like to write up OT evaluations in half the time? Do you dread writing up evaluations? Do you struggle to squeeze in the time to get the eval done before the student’s upcoming IEP meeting? Would you like to write up OT evaluations in half the time? The daily schedule of a school-based therapist is super busy. Most therapists, land up writing up reports late at night at home. Could you imagine if you could get it all done during your normal working hours? It would be amazing, right? (this post contains affiliate links which means we earn a small referral fee if you sign up). Jason Gonzales is an Occupational Therapist with years of pediatric experience. 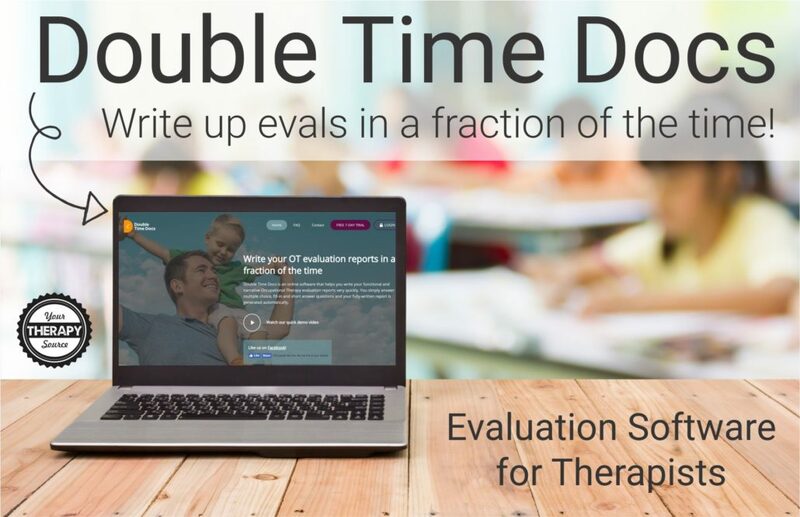 He has created an online software called Double Time Docs that allows you to write up OT evaluations in a fraction of the time. Reports done in a fraction of the time. A therapist can be more productive by focusing on planning, treatment, and consultations. Reports are written to the standards of the district. Reduces common errors such as wrong name, pronouns, etc. Write a fully functional OT report by answering questions and providing comments in about 30 minutes. This means that the therapist, district, or company does not have to change their IEPs software. The CEO of Double Time Docs, Jason Gonzales OTR, was nice enough to take some time to answer a few questions his company. Q: Tell us a little bit about yourself – job experience, years on the job, etc. My name is Jason Gonzales. I currently live in New Jersey with my wife, two kids and our chihuahua. I graduated from the Ohio State university in 2001. I have been a school-based OT for the past 16 years and worked in over 12 school districts in NY, HI, CA, MA, and NJ. I’ve also worked in mental health, SNF and early intervention. Q: What made you come up with this idea? When I graduated from the Ohio state university, my first real job was in New York City in a public school. I had no idea what I was doing. The principal had no idea what I did and I didn’t have any mentors. The PT helped me out and I pretty much learned on the job. In NYC I didn’t have to do any evaluations. I moved to Hawaii and worked on Maui. I was taught how to do a standardized assessment but wasn’t really taught how to write a report. So I went through a bunch of kids’ files and pieced together my own template. The next year I became the supervisor of 7 OTs and they were in the same boat as I was the previous year, not knowing what to write and what to include in their reports. As I moved around and worked with other therapists my reports got better and I believed that I had a pretty good template. But it was still taking me 2 hours to write a report. I started doing what most therapists do and cut and pasted to save time, but then there would be pronoun errors or I would accidentally forget to change a name. This was a common situation for all the therapists I worked with. As our profession got more popular and the referrals started to pile up, writing evaluations became one of the biggest complaints during our OT meetings. No one had time to write the evaluations. I knew there had to be an easier way. If I ask the same questions every time I evaluate a student why can’t I automate it? Q: What do you think is the best feature of Double Time Docs? There are so many beneficial features of Double Time Docs. One of my favorites is the fact that therapists can write 90 percent of their report while testing the student or consulting with the parent and teacher which can ultimately save a lot of time. Instead of taking notes I just open the software and answer the questions right there and the program writes the report. I do believe it’s a great teaching tool for both new grads or OTs new to the school setting. There are many more important things to worry about when starting a new job than scrambling to figure out how to write an eval. Q: What is available for therapists who work at different schools? Is there a discount for large therapy departments or private practices? On our website we have a variety of plans for individuals and we offer Team Pricing for companies and school districts. We know that the average OT does about 28 evaluations a year but some do a lot more and some do fewer. We have plans that should meet everyone’s needs. The Team option allows groups to get volume discounts. We will also be adding a PT and SLP template soon. We also offer an affiliate/referral program so OTs, PTs, SLPs, teachers and bloggers can earn a commission for referring their friends and colleagues to us. Please check out our website at https://www.doubletimedocs.com. So, if you are an Occupational Therapist, why not give Double Time Docs a try. I highly recommend using the FREE 7-Day Trial, with no credit card required, so you have nothing to lose by giving it a shot. After the FREE trial, they are offering 20% OFF for a limited time. Use the coupon code FALL18. They have 8 different monthly and yearly plans, so there is a plan to fit any caseload. The prices are very reasonable for the value and the time that it will save you. Give it a try and see how much time you save. We would love to hear from you if you try Double Time Docs out! One more thing, if you are a Physical Therapist, don’t worry your Double Time Docs online software is NOW AVAILABLE! Need more OT resources? Check out the Busy Therapist Bundle!